Trek-Segafredo & Sportful are delighted to present their new race kit for the 2017 season. The new kit, marked by a significant color change from white to red, was simultaneously presented at a Trek Bikes shop in Adelaide and at the team’s training camp in Mallorca this Friday. It will be used for racing throughout the year, thus completing the high visibility training outfit the team started wearing on January 1, 2017. The official launch of the 2017 race kit also marks the start of a new 3-year clothing partnership with Sportful. Sportful has a history of innovation and performance in cycling having supported some of the greatest teams in the peloton since 1985. The partnership with Trek Segafredo will allow Sportful to continue its research with athletes of the highest caliber, an instrumental factor in developing apparel that excels in all conditions. Trek-Segafredo has chosen to work with Sportful in consideration of their progressive approach to clothing design. The partnership gives the team access to a dedicated R&D program that looks to improve athlete performance in every race and training situation. 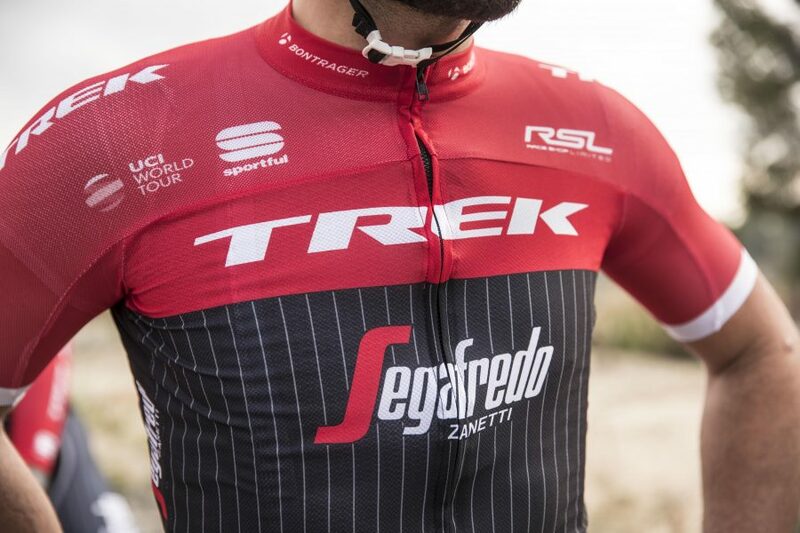 The partnership is not just limited to providing clothing for the riders of Trek-Segafredo, but will be expanding to allow fans of the team across the world, the ability to purchase the same products, used by their favorite athletes. After a full fitting session with the team, Trek-Segafredo athletes have now received their training and racing kits from Sportful. The apparel used by the pro team will include BodyFit Pro products, designed to give the perfect fit and ergonomics for pro level racing as well as Fiandre clothing designed for all weather protection with race performance. The team will also be using the Eurobike award winning Stelvio jacket for extreme conditions. Trek-Segafredo have also chosen Karpos outdoor clothing for their staff and athletes off the bike. Sportful began as project for its founder, Dr. Giordano Cremonese in 1972, seeing a lack of technical clothing for the sports he loved he decided to make his own. His innovative clothing soon attracted interest from others and within a year he was producing kit for athletes all over the Italian Dolomites. In 1985 Sportful began it’s first pro cycling partnership and have played a crucial part of Grand Tour, Classics, Olympic and World Championship victories ever since. Sportful are dedicated to making the perfect clothing for the best rides. This entry was posted in Cycling, News and tagged andrea peron, BodyFit Pro, contador, degenkolb, fiandre, karpos, sportful, stelvio, stuyven, trek, trek segafredo. Bookmark the permalink. The new team outfit is looking great!